Nap time for the baby rarely means downtime for the parents. Parents are just as much on call when their baby is taking a nap or going to bed for the night as they are when the baby is up and running around. Nap time for the baby rarely means downtime for the parents. Parents are just as much on call when their baby is taking a nap or going to bed for the night as they are when the baby is up and running around. Having a monitor in the baby’s room while he or she sleeps is the best way to keep a watchful eye and ear on the child. This helps the parent ensure the comfort and safety of the baby without being confined to the same room or run the risk of waking the baby every time the parent wants to check in. Baby monitors, especially with many of the high-tech features readily available in standard monitors today, help ensure a sleeping baby’s safety while the parent is in another room. These days, monitors can come equipped with both audio and video transmitters, remote activation of night lights or sounds, rechargeable batteries, and two-way audio transmitters. Some monitors even have night vision capabilities. Two-way audio transmission allows the parent to provide comfort to the baby immediately and easily. The parent can respond verbally as soon as the baby shows any sign of distress. There is no waiting as the parent can begin talking to the baby and comforting him or her from any part of the house. At times, the sound of a parent’s voice is just the reassurance the baby was looking for and enough to lull the baby back to rest. Video monitoring is another great way to check in on a child. Even if the baby isn’t making any noise, parents will know if the baby is lying awake quietly, sleeping restlessly, or resting soundly. Video monitoring comes in especially handy when traveling without a crib and parents want to make sure the baby doesn’t get too close to the edge of the bed. Parents no longer have to disrupt what they are doing to go in another room to check on their child. The baby monitor simply does it for them. Most importantly, baby monitors give parents the freedom to move around the house as their baby sleeps. Most monitors are easily carried around the house so the parent can continue chores, projects, or entertaining guests and have the monitor the whole time. Knowing any noise will alert them, parents can even take their own nap and sleep like a baby. 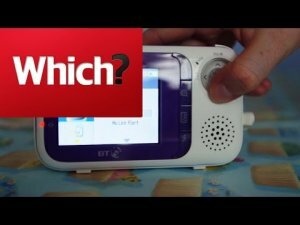 The baby monitor LCD screen is not as pixelated as it appears. My iphone contributed significantly to that. The monitor screen is actually very clear in real life. I Believe the DXR-8 is infant optics newest model. The monitor reminds me of a playstation vita. The audio will even pickup static noises in the room like an air purifier. After three hours the charge only dropped like 25% but who wants to leave their baby alone for that long? I have never needed to run the battery all the way out but it seems to last a really long time. My apartment is only 1000' so I can't give a great assessment of the range. I get full signal strength in all the rooms. Price is higher than the average baby monitor, but I think its worth it.